Head. N5 and N6. No representational figures. 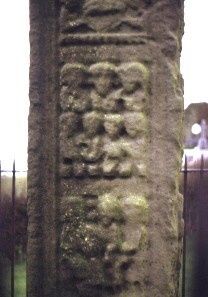 End of cross arm, unidentified figures , very weathered/worn. W2 Marriage feast of Cana. New Testament. On the uppermost part of the panel Christ is the central figure, with perhaps the Virgin on his left and ? figure on right. the second level has four figures the second from the right is pouring ?water into one of six vessels on the lower level of the panel.